Among our practical information, you will find documents to consult online, download and print if you wish. You will find in our brochure all the pricing information related to the locations, locations and options offered by our establishment. You can also consult the description and plans of each rental accommodation in our range. By downloading this document, you will be able to consult it offline and associate your loved ones more easily with your choice. The rental contract is included in the brochure, and can also be downloaded and printed separately. You can fill it in to make a reservation by mail. The terms and conditions of sale and cancellation conditions are also available online and for download. A satisfaction questionnaire is also printable: by completing it after your stay, you contribute to the improvement of our services. All you have to do is send it back to us by post or email to let us know what you liked or disliked, and send us any suggestions you may have. 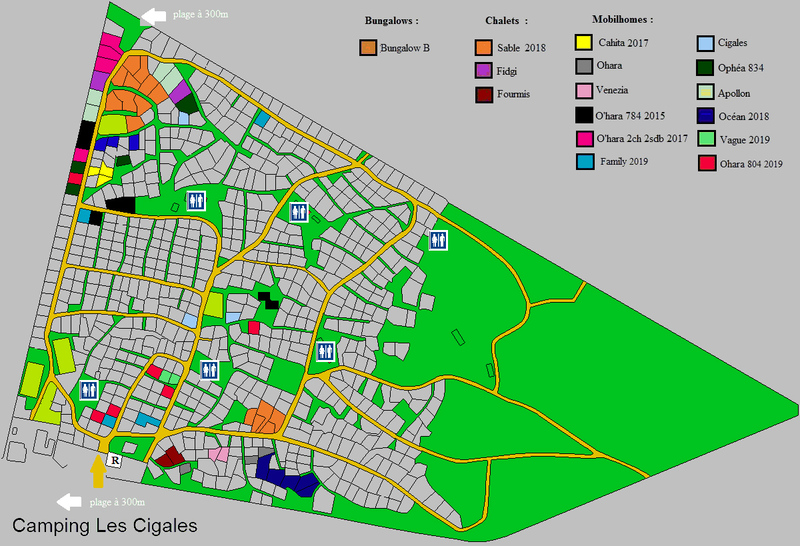 Very useful before making your reservation, the map of the campsite Les Cigales, also available on this page, allows you to visualize the configuration of the site and the situation of each mobile home model. Book your next camping trip in Moliets in the Landes now! Would you like to receive documentation? Do you have questions? Please fill in the following form, we will take care to answer you as soon as possible. An online contact form allows you to quickly send a request to the team of the campsite: request information, need assistance to make your reservation, we will answer you as soon as possible. You can also send an email from your inbox to reception@camping-les-cigales.fr. To reach us directly by telephone, dial 05 58 48 51 18. An online booking system allows you to select and pay for your stay in just a few clicks. If you travel by plane, you can land in the airports of Biarritz or Bordeaux, respectively located at 1:00 and 1:30 by car from Moliets. By train, Dax station is served from many departure cities. A TER connects Dax to Moliets station in 35 minutes. If you travel by car: from Bordeaux, take the N10 towards Bayonne, then take exit 12 towards Léon; from Biarritz, take the A63 towards Bordeaux until exit 11 towards Léon. From Pau, first follow the A64 to Bayonne, take exit 6, enter the A63 towards Bordeaux at Saint-Geours-de-Maremne, then leave the motorway exit 11, towards Léon.